The grocery store had donated to the GOP gubernatorial candidate in Florida. 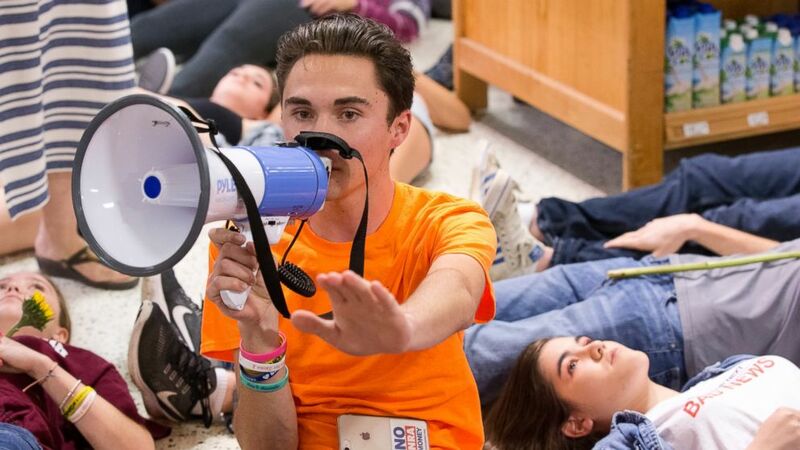 camera (AP) Marjorie Stoneman Douglas High School student David Hogg speaks as demonstrators lie on the floor at a Publix Supermarket in Coral Springs, Fla., Friday, May 25, 2018. The grocery store chain Publix was on the defensive Friday evening after Parkland student activist David Hogg staged a "die in" over the store's donations to Florida Republican gubernatorial candidate Adam Putnam. Publix announced Friday it would suspend political donations in the wake of Hogg's organized protest. "At Publix, we respect the students and members of the community who have chosen to express their voices on these issues," the grocery store said in a statement. "We regret that our contributions have led to a divide in our community. We did not intend to put our associates and the customers they serve in the middle of a political debate. At the same time, we remain committed to maintaining a welcoming shopping environment for our customers. "We would never knowingly disappoint our customers or the communities we serve," the statement continued. "As a result, we decided earlier this week to suspend corporate-funded political contributions as we reevaluate our giving processes." 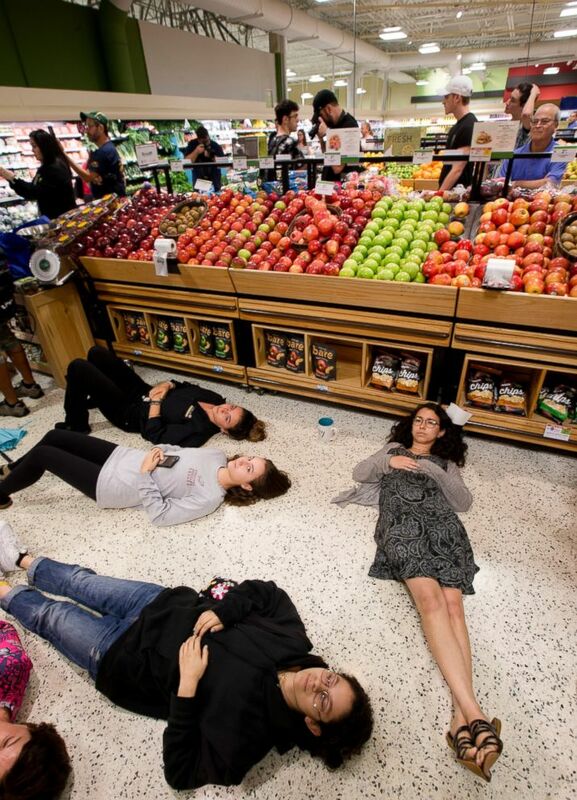 (AP) Demonstrators lie on the floor at a Publix Supermarket in Coral Springs, Fla., Friday, May 25, 2018. Students from the Florida high school where 17 people were shot and killed earlier this year did a "die in" protest at a supermarket chain that backs a gubernatorial candidate allied with the National Rifle Association. Hogg, a student who survived the Feb. 14 shooting at Marjory Stoneman Douglas High School, campaigned against Publix over the store's donations to Putnam, who is an ardent supporter of the National Rifle Association. Putnam, who has served as Florida state agricultural commissioner since 2010, is running in this year's election to replace Rick Scott as governor. Publix is one of Putnam's biggest contributors. The grocery store donated over $118,000 to Putnam's campaigns from 1999 to 2012, according to the Center for Responsive Politics, a nonpartisan group that tracks funding and lobbying efforts. The grocery store has donated over $2.1 million to political candidates and political action committees (PACs) in the 2018 election cycle, according to the Florida Division of Elections. While only $3,000 was donated directly to Putnam from Publix, many of the PACs which received hundreds of thousands of dollars have relationships with Putnam's campaign. Hogg tweeted "Together we can do anything" after the "die in" and news of the grocery store's halt to political donations. Putnam is an outspoken supporter of the NRA. He tweeted on July 25, 2017, "The liberal media recently called me a sellout to the NRA. I'm a proud #NRASellout!" He was given an A+ by the NRA in its ratings in 2010. Hogg started the momentum against Putnam and Publix in a tweet on May 22, when he called for people to stop shopping at the store until it rescinded its endorsement of the candidate. Putnam has not commented on Hogg's activism. Hogg has organized for a number of causes since the Valentine's Day shooting that killed 17 students and teachers at Marjory Stoneman Douglas High School. In March, he and a group of Parkland students organized the March for Our Lives. The main event, which took place in Washington, D.C., called for increased gun control and sprouted sister marches in all 50 states and hundreds of thousands of participants. The 17-year-old also successfully organized companies to pull funding from Laura Ingraham's Fox News show, "The Ingraham Angle," after she made fun of him for not being accepted by a number of colleges. At least 16 companies pulled commercials from the show in the wake of Hogg's criticism. He also called for a boycott of Blackrock and Vanguard Group, a pair of investment firms with indirect stakes in gun companies, in April.